Please join me and my family in our efforts to support the Food Allergy and Anaphylaxis Network Walk for Food Allergy: Moving Toward a Cure. FAAN provides much needed education and advocacy to families and individuals dealing with often life threatening food allergies. They have provided much needed funding to agencies like Medic Alert, to provide medical ID bracelets along with call in service for medical responders, free of charge to children. Please read more about their mission statement by clicking here. We found that when Abigayil was diagnosed at 10 months old after a near fatal reaction to milk, that there was not a lot of information readily available for dealing with this type of medical issue in such a young child. That was, until we were referred to FAAN a few months later. FAAN has personally helped myself and my family in our ongoing quest to provide for our 3year old daughter, Abigayil. Abigayil suffers from severe multiple food allergies to dairy, eggs, peanuts, tree nuts, and many common food additives. FAAN has provided the networking, recipies, recall alerts, and allergen alerts needed to keep her healthy and growing. My hope is that together we can raise enough money to keep this going for many more families facing the distress of food allergy and anaphylaxis. 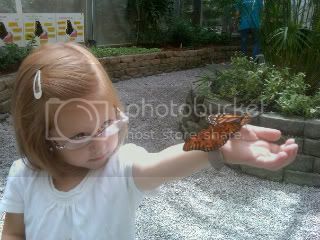 The butterflies love her allergy alert bracelet too! I would love to give something back to this wonderful organization. My family and I will be participating in the Food Allergy and Anaphylaxis Network: Walk For the Cure on September 19th, 2010 in Lincoln, NE. Please help us reach our family goal of $150.00 by donating online at the Team Safety MAP walk page. You can click on my name (Sarah) and use the Support Me button to make your donation. Thank you for your support! Intersted in participating in a local walk? Check out the 2010 Walk Locations page and sign up for one in your area.